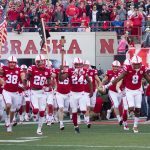 The Nebraska football team held a two hour practice Thursday morning, as they begin to wrap up preperations for this Saturday’s game against Troy. The biggest question mark going into the game is who will be the Husker’s starting quarterback. Will it be true freshman Adrian Martinez, who injured his knee in last week loss to Colorado? Head coach Scott Frost says a decision might not come until gameday. Frost says Martinez will not be rushed back into action. The Huskers host the Trojans of Troy this Saturday morning at 11:00. This will be the fifth all-time meeting between the schools. The Huskers defeated Troy four times in six seasons between 2001 and 2006. All of those games were in Lincoln. The Huskers and Trojans are set to kickoff at 11:00. Visit www.HUSKERMAX.com for more.